To conduct a census of wintering falcons during December so that we may attempt to annually track this population of peregrine falcons, in comparison to breeding birds; To help keep the youngsters safe upon fledging; To learn more about longevity, nest site tenacity, and juvenile dispersal at a sample of the locations. The Peregrine Falcon continues to be an important indicator of ecological health and careful monitoring of its population will help Santa Cruz Predatory Bird Research Group better understand our ecosystem. Winter Survey: Using a “point survey” method, a list of OPs (observation posts) is prepared and volunteers staff the locations during a specific period of time and on a specific day each winter. Volunteers note the location of perched peregrine falcons and the duration of time that the falcon is visible to them. This repeated annually. Fledge Watch: Gather near the two nest locations (PG&E Headquarters and San Jose City Hall) and commit to shifts to help keep the youngsters safe upon fledging. The goal of fledge watch is to see the first flight (or fledge) of each bird and then return it to the care of its parents should that need to occur. We are there to spot them, keep them safe, and then direct a qualified individual to the bird so that it may be picked up and provided with an elevator ride to the roof where parental care will resume. Nest Monitoring: Survey approximately thirty nest territories in the San Francisco Bay Area for occupancy and productivity; Band nestlings to learn more about longevity, nest site tenacity, and juvenile dispersal at a sample of the locations. Online discussion group; additional training and participation in banding, nest monitoring, etc. Fledge Watch: Training is required for full participation. Interested members of the public can subscribe to the online discussion group for the nest camera location of interest to stay up to date and learn more about the date and location of training opportunities. Predatory Bird Research Group will provide a background on the Peregrine Falcon Recovery and training for interested volunteers who wish to participate by committing to one or more Fledge Watch shifts during early June. 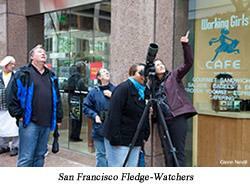 Watch for information on the home page announcing upcoming opportunities for fledge watch training. Posted on web and shared with volunteers; used in ongoing analysis of population and in decisions about how to support populations. For our Winter Survey, Predatory Bird Research Group organize a fixed point survey that occurs between 0900 and 1100 on the second Saturday of each December, and coordinate students and volunteers and local community leaders at forty-eight observation posts around San Francisco Bay. Please contact the project in early November to express an interest in participating in the winter survey.